1. Nuea Daeng Ongk Kroo Pised Fang Chin Aathanaint See Red Maha Sanaeh Prai Powders and earths, with Nin Stone, and a Chin Aathan Mortal Remains (Ghost Bone) insert hidden within. 2. 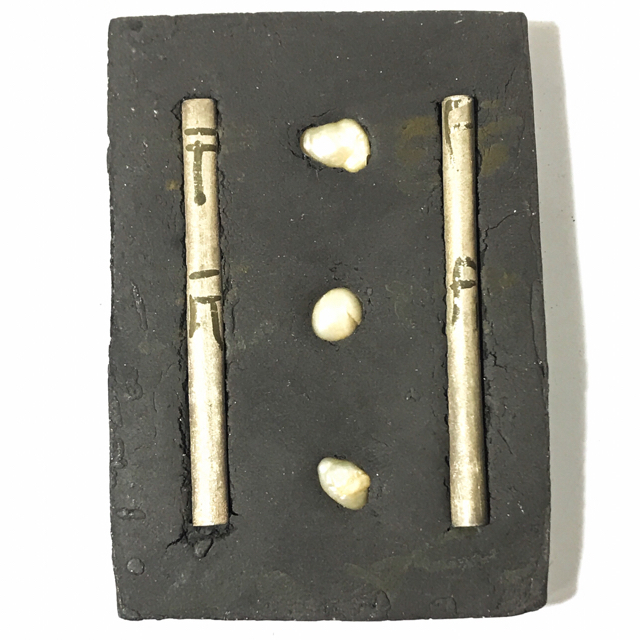 Nuea Dam Ongk Kroo Pim Yai Fang Mukh Sord Takrut Ngern Koo – Black Powders Jumbo size with 3 sea pearls and two silver Takrut scroll spells, and ghost bone hidden within the interior. 3. Nuea Khaw Ongk Kroo Pim Yai Fang Mukh Sord Takrut Ngern Koo – White Powders Jumbo size with 3 sea pearls and two silver Takrut scroll spells, and ghost bone hidden within the interior. 4. Nuea Nam Dtan Ongk Kroo Pim Yai Fang Mukh Sord Takrut Ngern Koo – White Powders Jumbo size with 3 sea pearls and two silver Takrut scroll spells, and ghost bone hidden within the interior. 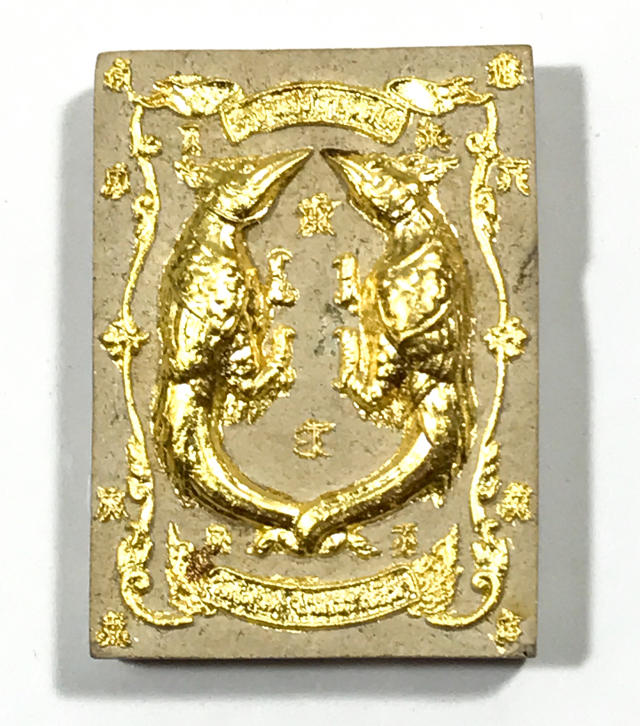 This Kumarn Tong amulet has received much fame from stories of devotees who tell that the dogs bark at night when this amulet is in the household. This is because they can see the spirit of the Kumarn Tong. This extremely rare early era series was blessed in a very sacred necromantic Ritual during the Kern Maa Horn ‘Night of the Howling Dogs’, between 20:00 and 0:300 Hours in the year 2548 BE. The Ritual was begun during the fearful hour of the howling dogs where the cemetery is full of ghosts, and on the night of the ritual, a total of 109 Monks were invited down to the ceremony in the cemetery, but by the time the procession had reached the ritual ground, only 15 monks were remaining, as the rest were to afraid to enter the haunted cemetery. The front face of the amulet features the Kumarn Tong Song Krueang, in princely regalia, holding a sack of gold. The Kumarn has an aura, indicating that the Kumarn spirit invoked is that of a ‘Kumarn taep’ child spirit of the Deva Realms. 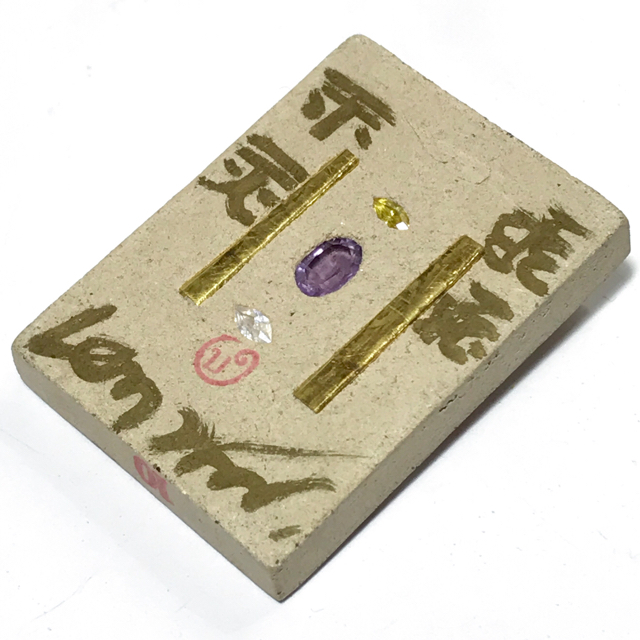 Sacred Incantations in Taewanakrii script is embossed either side of the Kumarn. 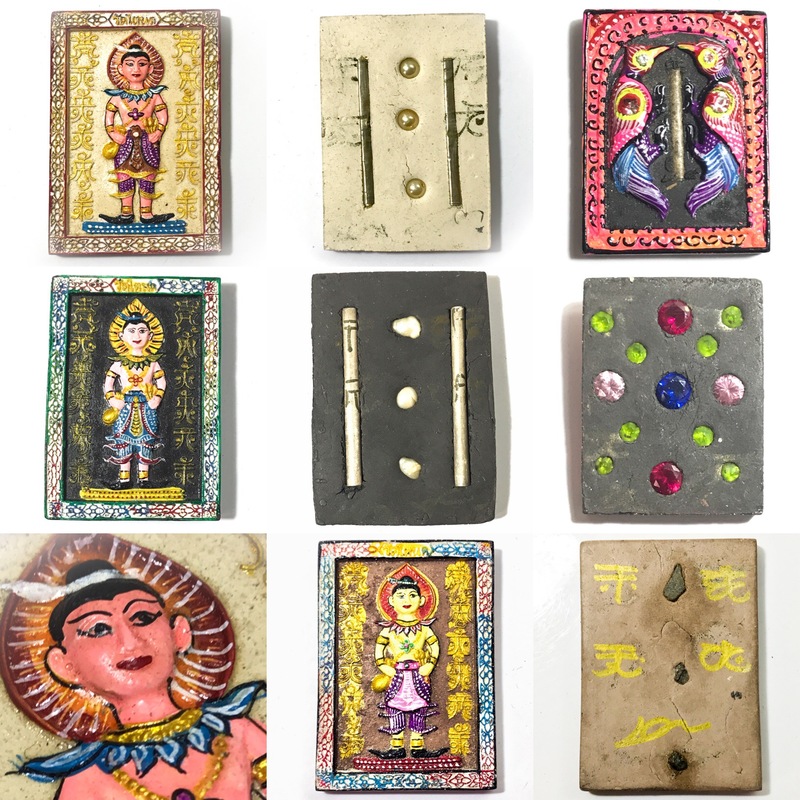 Each amulet is individually hand painted and empowered. The Kumarn were hand painted with coloured robes and aura. 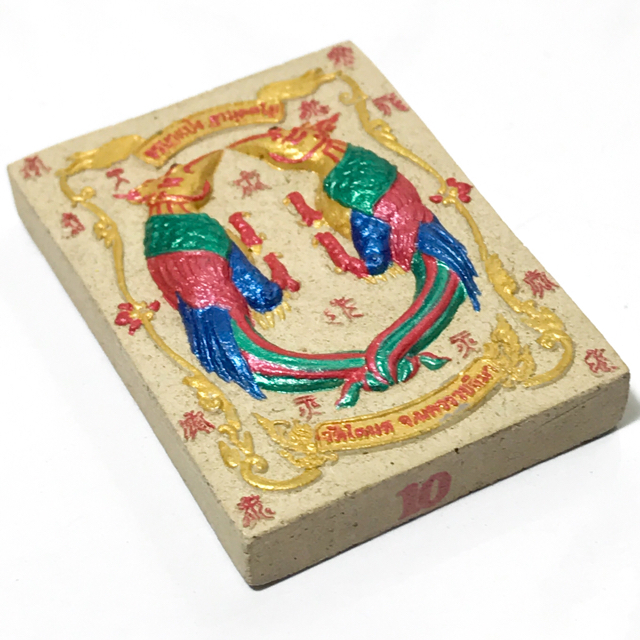 The Muan Sarn Sacred Powders contain Din Bpoeng clay from a Sacred Saltlick, Sanaeh herbal Pollens, Kumarn Bone powders, and Sacred Necromantic Earths, and Ashes, mixed with See Pheung Gern Ber Neung Waxy Potion, and some Powerful Nam Man Prai Phii Dtaay Hoeng Necromantic Oil. Some models were also left unpainted for purists. 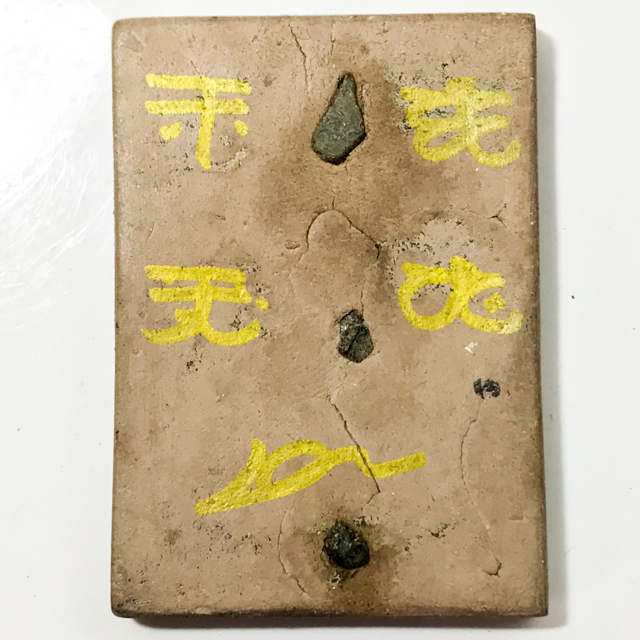 The rear face are hand made Sanscrit Spell Inscriptions from Kroo Ba Beng, and a piece of ‘Chin Aathan’ mortal remains of the Hoeng Prai Kumarn were inserted (hidden within the amulet), with various magical items inserted into the clay of the rear face (depending on model). The Kumarn were Empowered according to the Dtamra of the Lineage of Kroo Ba Ajarn of Kroo Ba Beng and Lersi Bangbod, by Performing Incantations of Empowerment with the The full formula of Invocations for the Kata Akarn Sam Sip Sorng, 32 Elements of Living Beings Incantation, which were performed for reanimation of the spirit within the effigy. 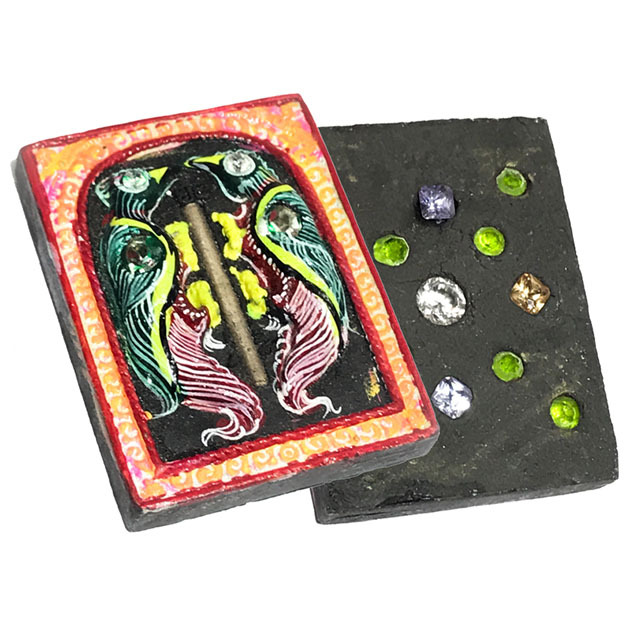 Nok Sariga Pim Lek Nuea Pong Prai Kumarn Dam Paint See Fang Ploi – Black Kumarn Powders with Hand Painted magpies and 17 Ploi Sek Maha Pokasap Gems (4 in front face, 13 in rear face). 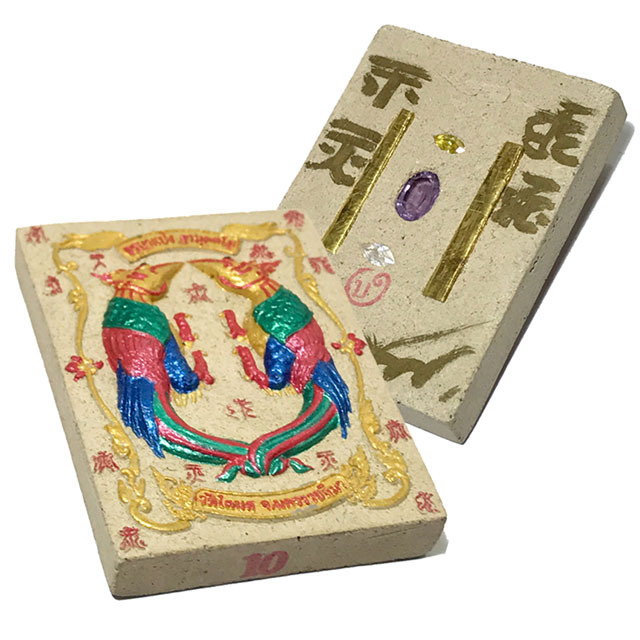 The Taep Sariga Koo Ongk Kroo is made and blessed in 2551 BE, with only 54 Amulets made in this extreme limited series. 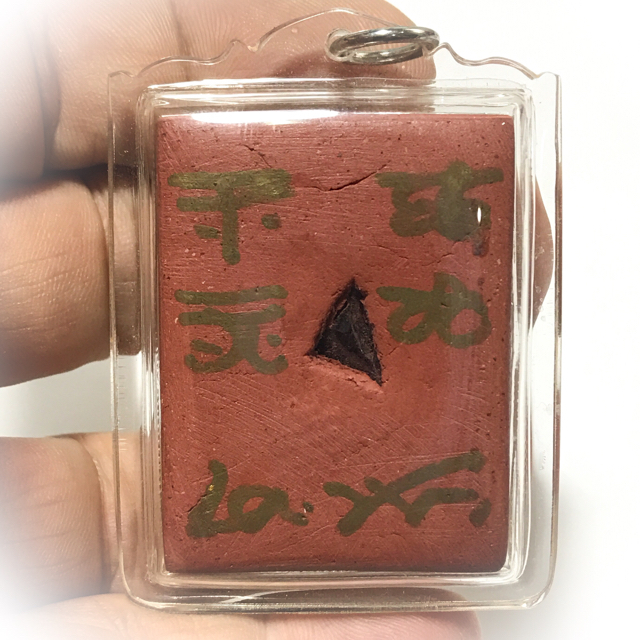 The amulets were made in Black Prai Maha Sanaeh Powders with Kumarn Tong Bone Powders and Necromantic Earths and Ashes, Lek Lai Powders, mixed with Kroo Ba Beng’s famous See Pheung Gern Neung Waxy Potion and Powerful Necromantic Prai Oils. The amulet has 1 Takrut Maha Sanaeh Maha Lap, and 17 Ploi Sek Maha Pokasap Enchanted Wealth Attracting Gemstones inserted. Special Ongk Kroo Master-Piece version Early-Era amulets of the 2546 BE edition from Kroo Ba Beng, Ongk Kroo Pim B having 2 solid silver Takrut spells, a piece of turqoise, and 2 Ploi Sek Enchanted Gems, and Ongk Kroo Pim A having 2 Solid Gold Takrut spells, an Amethyst and 2 Ploi Sek Enchanted Gems embedded. 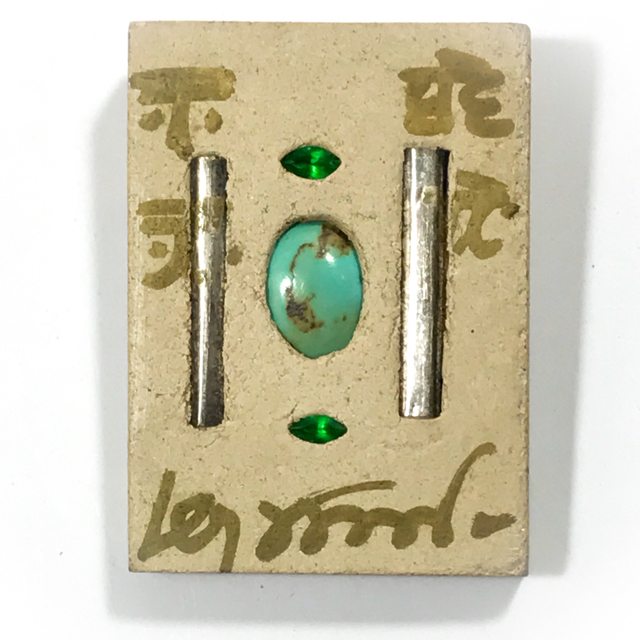 Kroo Ba Beng’s amulets are a niche of their own, with his early era amulets being equally regarded as those of his magical companion and ex accomplice Kroo Ba Krissana Intawano. 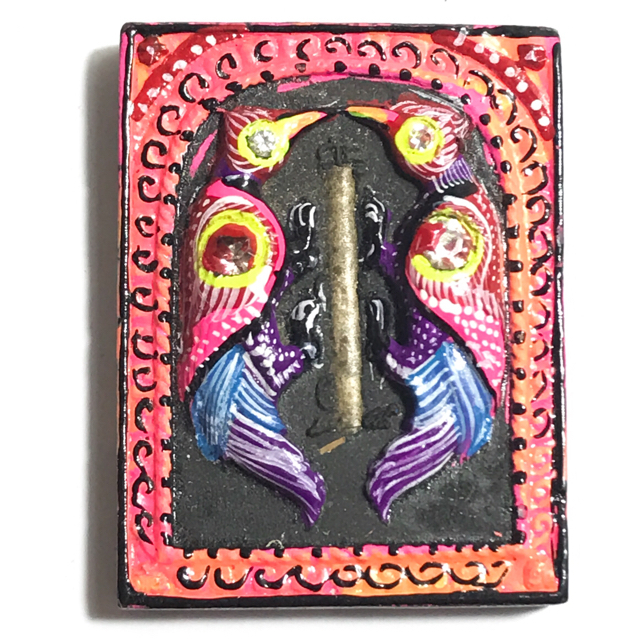 Both of these Masters are known for their hand painted sacred amulets using the Wicha Teerayan which both Kroo Ba Krissana and Kroo Ba Beng inherited from the Lao Ruesi Bangbod. 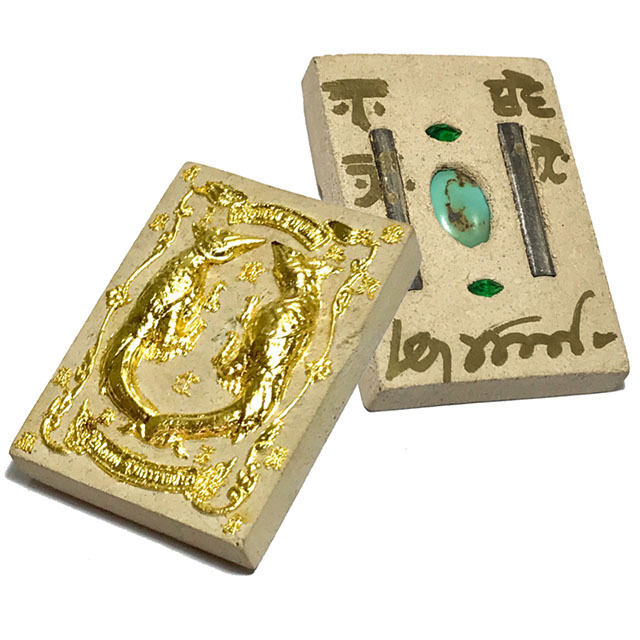 It was the Lersi Bangbod who gave the Wicha of the Taep Jamlaeng Butterfly King Amulet, the Wicha Sariga Dong, the Wicha Teerayan, and many other strange techniques of magical empowerment to these two Masters. 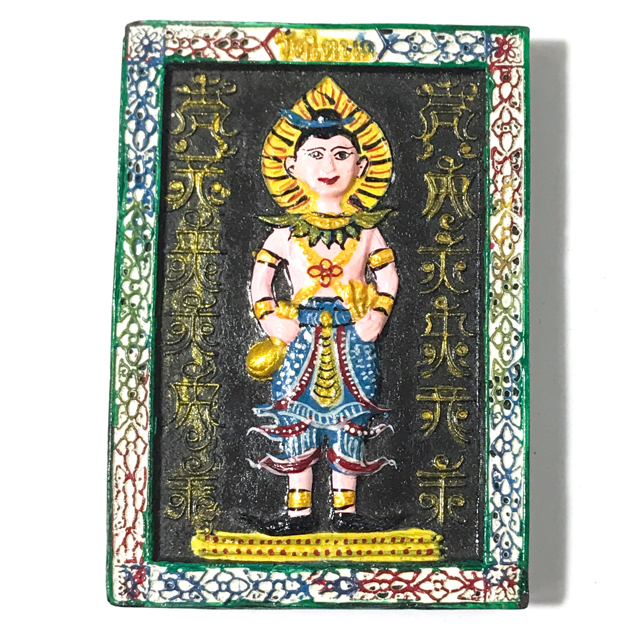 Kroo Ba Beng’s amulets have always held a cult status with the devotees of this Master in Thailand, and also in Singapore. But in recent years he has begun to take on a much. larger international interest, and has slowly become as internationally known as his accomplice and lifetime friend, Kroo Ba Krissana Intawano of Wat Weluwan. Both Kroo Ba Krissana Intawano, and Kroo Ba Beng, were apprenticed to that great forest Master Sorceror from whom they learned the Wicha Taep Jamlaeng Butterfly King, and the Wicha Sariga Dong. 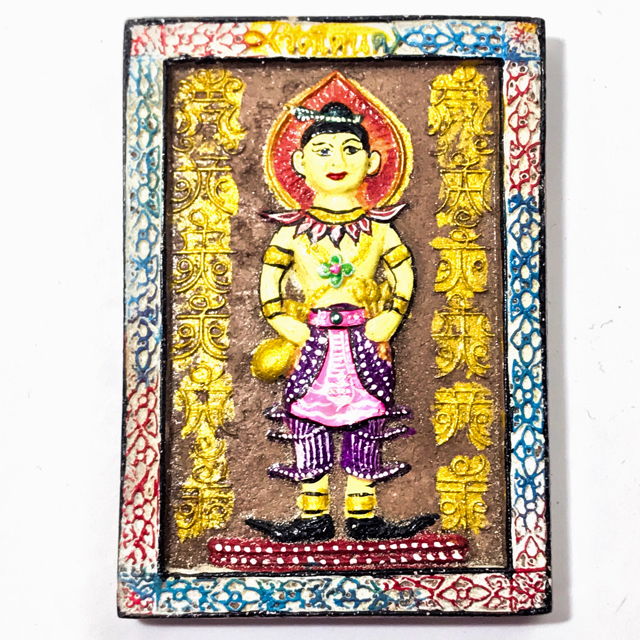 Kroo Ba Beng is known for his powerful Wicha Sariga Dong Celestial Himapant Forest Magpie, so effective for sweet talking and convincing others with ‘Jerajaa’ speech enchantments, and for Metta Mahaniyom Mercy Charm, to use for Business Improvement. He has imbued these Kumarn Tong with precisely this same kind of Kaa Khaay Jerajaa Magic to induce Mercy and Great Preference (Bias) in your favour. This is especially useful magic for market traders or those who have to compete in an arena of competitors, where each is vying to attract te interests of the customers. 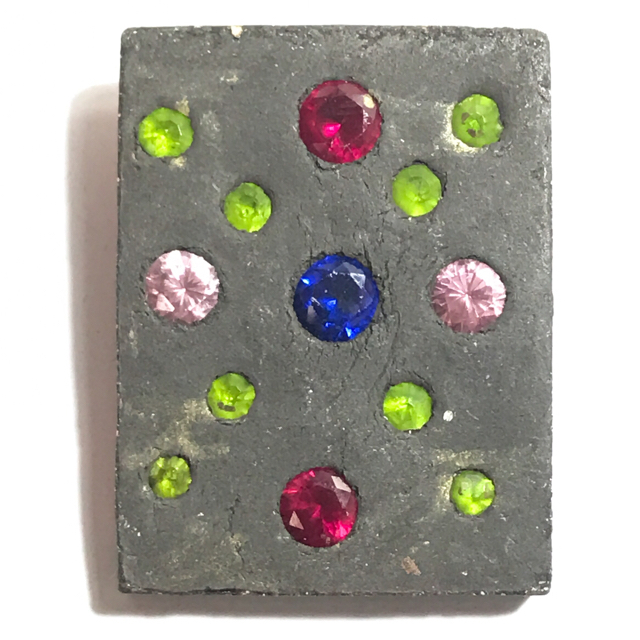 Jerajaa Kaa Khaay Magic assists greatly in drawing the interest and focus of the customer or lover towards you, and lock them into your line of focus. 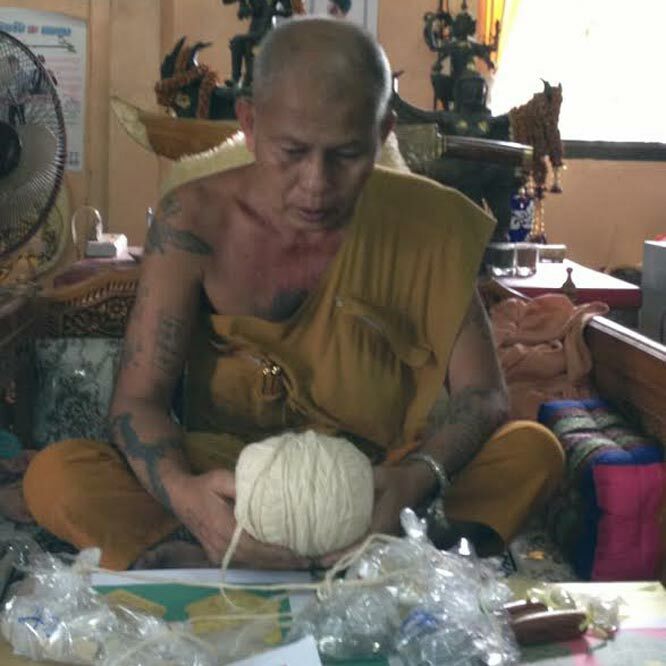 Kroo Ba Beng has now become so appreciated and revered, for his ability to empower the Amulets with Great Metta Mahaniyom, and Maha Sanaeh, along with Maha Lap and Maha Pokasap power. 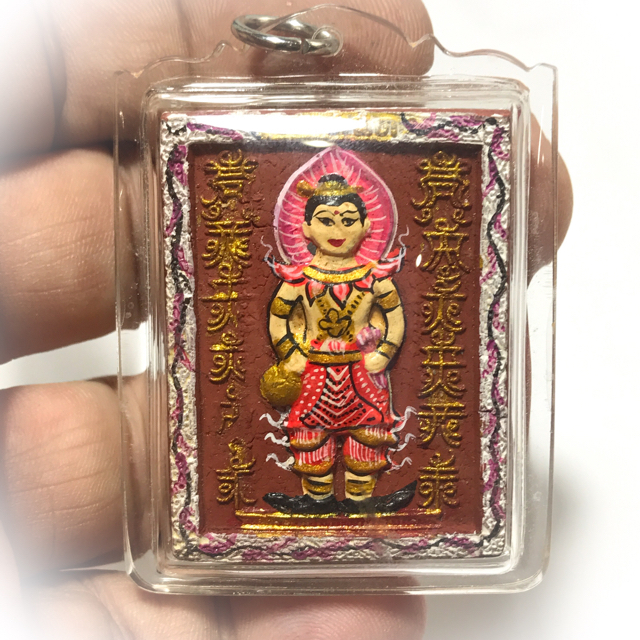 Their incredibly attractive appearance, hand painted design, and high-quality content of sacred powders semi precious and precious gemstones, and other powerful substances, is what has made the amulets of Kroo Ba Beng, and his companion Kroo Ba Krissana, the two Master Wicha holders and most popular makers of Mercy Charm Wealth increasing amulets of high esteem. Kroo ba Beng also dominates the Wicha Pra Khun Phaen, Sariga, and many Necromantic Wicha, such as the Kumarn Tong, In Koo, and the Nang Jing Jork Gao Hang Nine Tailed Fox Prai Deva.